All during the Christmas holiday season there are bright colours everywhere. Sometimes it’s just too much and I have to be so very monochrome. You can find the GxG blog HERE. Merchant list and sim maps can be found HERE. The event is across 2 sims. Sometimes a girl just needs to take a break in the woods. Here are your LMs: Sium, Port Seraphine and Cursed. 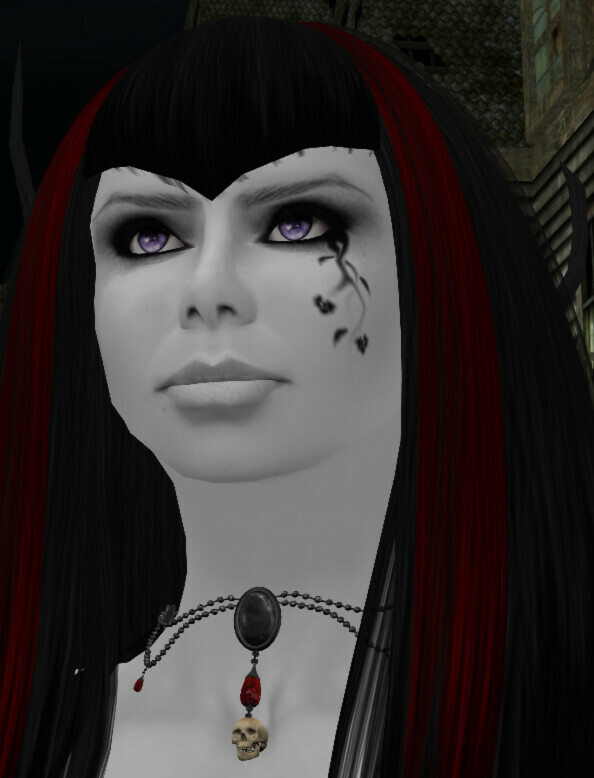 The WGF blog can be found HERE and there are lists if the merchants so you know what Sim they’re on. So just to show that there is a right way to do things, Axi and Cruel Britannia went out and talked to a bunch of bands that they know and we all love and got permission to use their band logos on tshirts. They were able to get permission from 34 bands to make tshirts for the WGF with all proceeds going to S.O.P.H.I.E. They are mesh shirts and there are male and female styles. 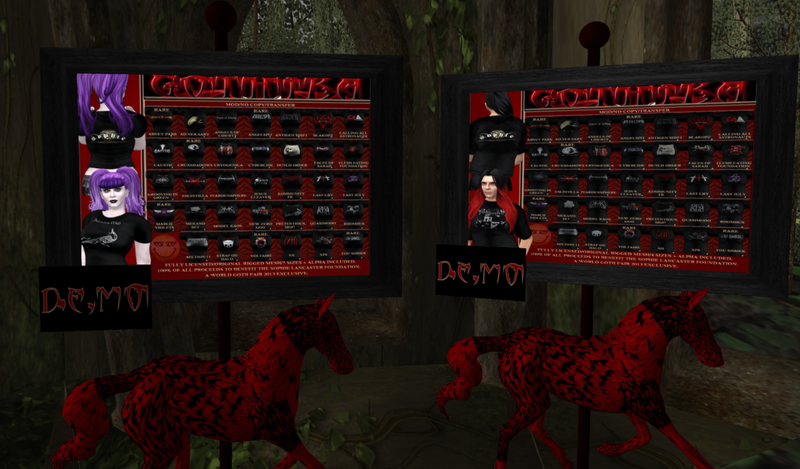 You can find them on Cursed and on Port Seraphine You have until Noon on June1st to get the shirts you want. Only 40L each and all fully licensed. There are of course rares and the most sought after appears to be the You Shriek shirt. Not only because Razi & You Shriek is awesome, but because the gachas appear to like screwing with us and not giving out as many as we’d like. While not intentional on Axi’s part, it does mean that some ferocious trading is happening. Of course unless you’re like me and spend waaaaay to much trying to get that damned shirt. In the end my lovely friend Syn gave me hers. I do have a complete set of shirts though…and oh so many duplicates. WGF – Why Hello Mister Kraken! Axi told Lokii not to summon anything. This of course meant that Lokii was pretty much required to summon something. You can’t feed him, but no one said I couldn’t make friends and feed him stupid people. Everything I’m wearing is from the World Goth Fair with the exception of my hair and nails. 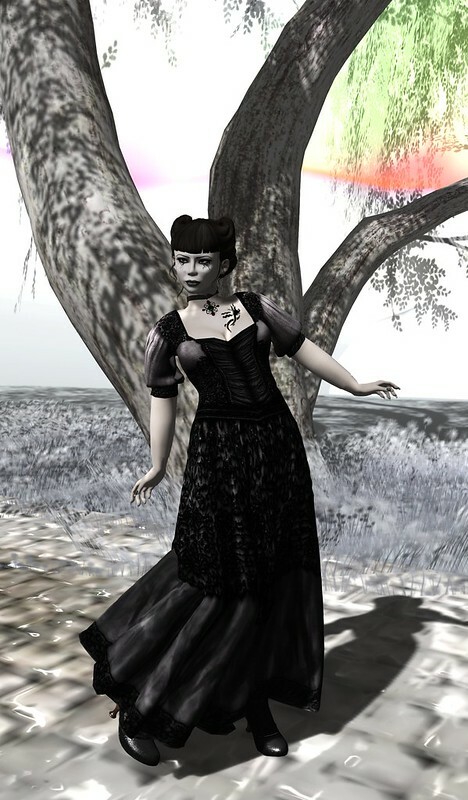 WGF can be found on Cursed and Port Seraphine until May 31st. Here’s a close-up of the make-up, necklace and shoes for you. 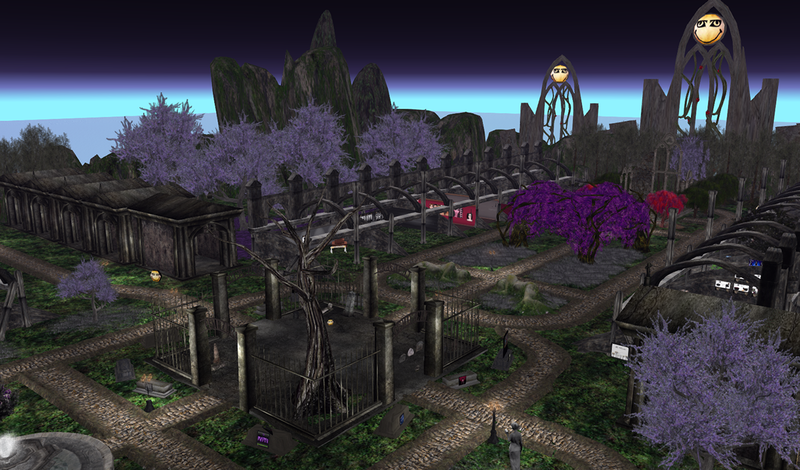 More WGF sim preview. Don’t worry, I have much clothes to show you, but I think very often the hard work that goes into the building of the environments for these faires gets overlooked. Both locations are wonderfully laid out and a pleasure to see and walk through. A lot of thought went into both locations and I want to show them off too. The builders deserve much credit. So this time the buildings were made my Nephilaine and the putting everything in its place was done by Lokii Violet (Mistress of building shiny stuff) and Axi Kurmin (WGF Mistress). So without further ado, some shiny unadulterated pictures.